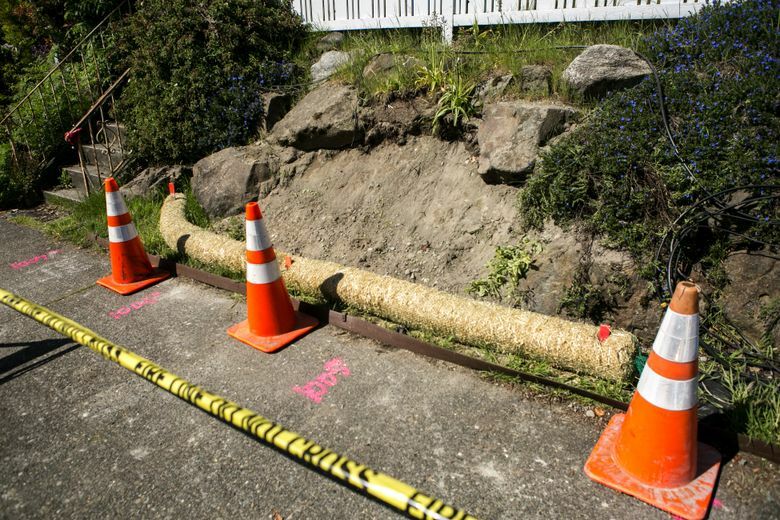 Sound Transit’s tunneling operations apparently caused a sinkhole next to a Roosevelt-area home, the agency said Sunday. 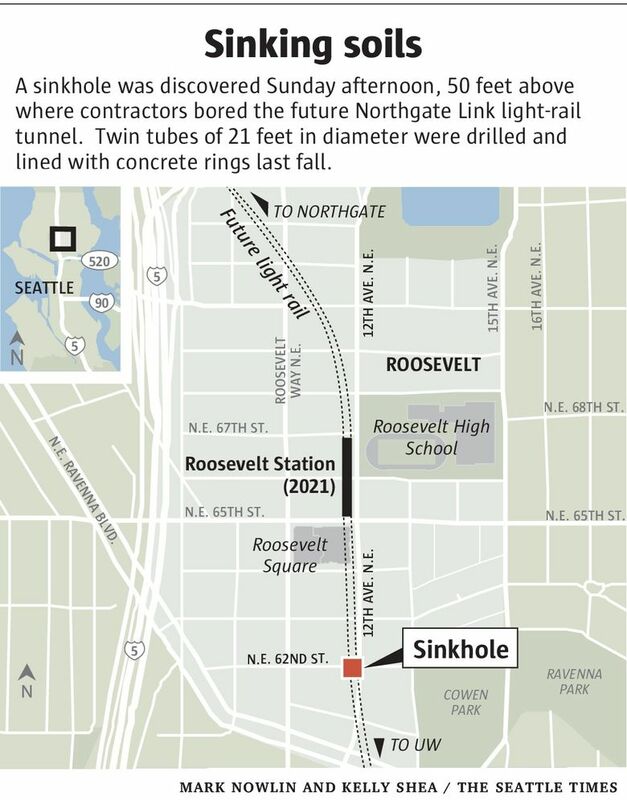 A sinkhole formed in the Roosevelt neighborhood above one of Sound Transit’s future train tunnels, the agency said Sunday. It was reported at 4 p.m. between the sidewalk and a front yard, on 12th Avenue Northeast near 62nd Street Northeast, said a statement by agency spokesman Geoff Patrick. Residents of that house and the home next door are staying at a hotel at Sound Transit’s expense. The sinkhole is 6 feet long and 2-3 feet wide. Its depth is unknown. It was filled with concrete Sunday night, and Sound Transit and contractors planned to check for other “voids” below the surface. A subway segment of Link light rail, to open in 2021 from Husky Stadium to Northgate, passes 50 feet beneath, and was excavated last fall. This sinkhole formed while the whole region is in suspense over whether sinkholes or ground settlement will happen at the larger Highway 99 tunnel, where boring machine Bertha will pass below the Alaskan Way Viaduct this week. A large sinkhole formed near that project on Jan. 12, but in an area where a buried wall of pillars protects the viaduct. This is the second time light-rail construction caused a sinkhole. 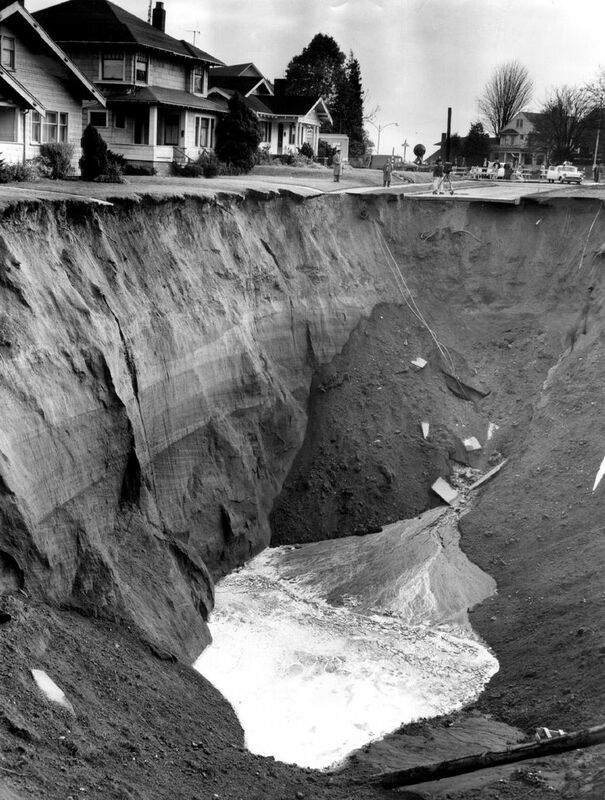 Seven underground voids were discovered in 2009 just east of the Beacon Hill Station, of which one void reached the surface and nearly swallowed a house. In addition to Sunday’s sinkhole, the Northgate line is having problems with unexpected volumes of groundwater. To solve that problem, the contractor must freeze the soil, at a cost of $44 million from the project’s contingency funds. Unstable ground appeared in five cross passages between the twin subway tubes. The tunneling contract, by a joint venture of Jay Dee, Coluccio and Michels, is worth about $506 million of the overall $1.9 billion project. Residents with questions about the Roosevelt sinkhole may call transit construction outreach staff at 1-888-298-2395.